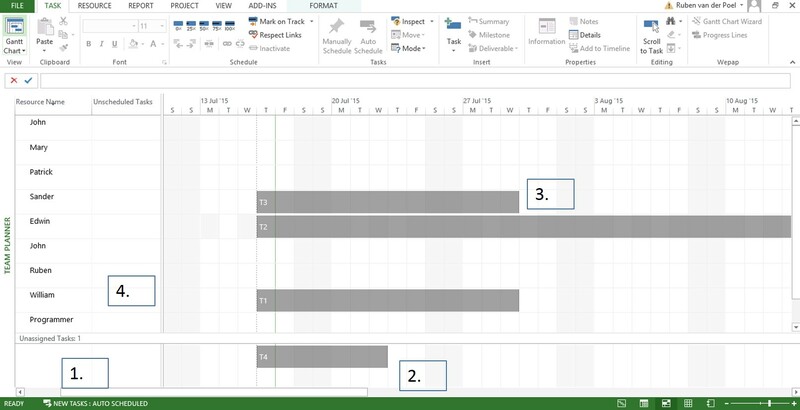 Use the Team Planner view (only available in the professional version of MS Project) for a quick and easy way to see which tasks are assigned to which resources. In the Team Planner you can easily drag and drop tasks; however this is not recommended as moving tasks will create a constraint on that task. An overallocation would also show red in the Team Planner. When using the Team Planner, see this tool as a quadrant where each of the four sections has a distinct meaning. The Team Planner can be used as a traditional plan board, but you should realize that when you reschedule a task manually, you are adding constraints to your schedule. Let us know your experiences with the team planner view and what you like most about it? ← How to change the resource calendar?